It really is made from stuff that came out of drawers at my house. Deb has this saying, "at arms reach" when she's working on something. In other words, " I'm going to use what I have in the studio before I go to the store to buy something". Now maybe I should preface that saying by mentioning that if you have ever been to or seen Debbie's studio you would not need to go to the store. So much vintage stuff and the inspiration is endless. So with that philosophy in mind I decided I was going to create something using 7gypsy product and the junk in my workroom. Remember, you saw my desk...I have a lot of junk. Just that simple. I had a ceiling tile in my garage, (don't ask me why) but you can purchase one at Home Depot for under $3. I laid out the tags I wanted to use to decide on spacing. 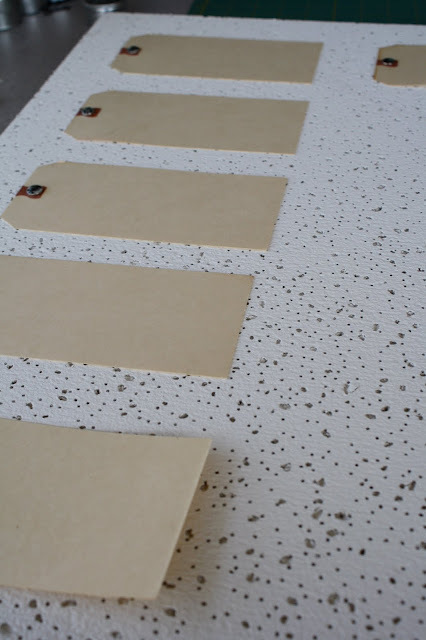 I used large tags (#8 Manila shipping tag 3 1/8 x 6 1/4"), 5 rows of 5 tags each for a total of 25 tags. 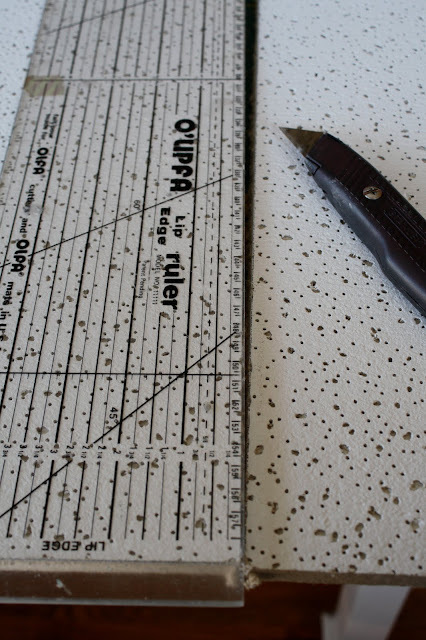 Once I determined the spacing, I cut off about 5 inches off the ceiling tile using my clear quilting ruler (one of my FAVORITE tools in the workroom) and a box cutter. The quilting ruler has a lip edge (very important) so it works like a carpenters square. If the side is straight, the line will be straight. The cut tile is 24 x 40", however this size would change if you use a different size tags. I cut a piece of burlap (left over from another gypsy project) 2-3" larger than the ceiling tile. 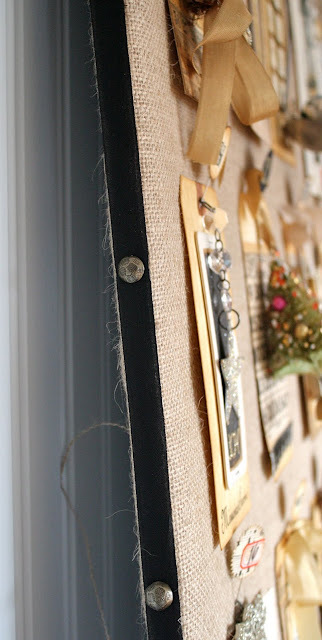 I used my handy dandy staple gun to tack down the burlap. Just remember to work in opposites... right side, left side, then top, bottom so that the fabric remain as tight as possible. A word of Caution: You have to be careful with ceiling tiles. It is great for push pins (the reason I chose it...and it was in my garage) but if you drop it, it can break easily or the corners will pulverize and I won't even go into what it does if it gets wet...let's just say, "don't get it wet". Previously, I had used another product I found at Home Depot in the insulation department. It came in a large sheet 4 x 8 feet. It was much sturdier so it did not have the pulverizing problem that the ceiling tiles have. My dad, who was with me when I bought it, mentioned it was used in walls for soundproofing. I do not know if they still have this product or even what it was called. What I do know is that there wasn't any in my garage last week when I started this project so I didn't use it. Once I finished covering the board, I ran black seam binding around the edge of the board and secured with a couple straight pins. I found some leftover upholstery tacks in a drawer and used them to secure the ribbon about every 5 inches. I didn't have enough for the bottom so I just left the straight pins in. I figured no one would ever see it. I think the upholstery tacks would look great if they were pushed in the edge in a very haphazard way, like 2 together, then a space, then 1, then a space, then 3, etc. I just didn't have enough on hand to do this. Maybe it's back to the garge to look for more because the more think about it, the more I like the haphazard idea. It takes at least 7 tacks on each of the long sides to finish the board like I did or about 24 total. Just found your blog through 7G's! I love it, so much inspiration. This is just fabulous...by far it's my favorite advent calender I've see this season! I've signed up as a follower. Stunning and incredible creative! I love how you finished the ceiling tile! So beautiful, and since I am pulling treasures 'out of the drawer' for mary anns class I think i will play along too! Ok back to read the rest of your blog! Totally following you! Wow! 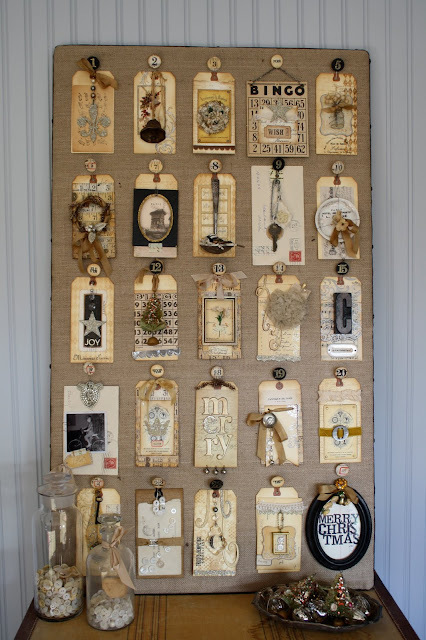 I enjoyed perusing your blog today - the tags are so creative and that advent calendar is to die for! The bird on the ladle is my fave so far. Be still my heart! I think I came for a visit from Rebecca Sower, either way, I LOVE your advent calender and thank you so much for showing us how to make it. It's just full of treasures! I also love your blog design, right up my alley. I'll definitely be back for another visit. This is just stunning. I love your junk. Clever, love this! Glad to have found you on Pinterest! I bought the disk from you when you introduced it, and I finally got around to making the advent calendar...or trying. My friend and I spent a solid 2 days, 10 a.m. to 7 p.m. building the foundations for each tag and we have a third and (hopefully) final day scheduled soon. Thank you, 5 years late. no problem Gina! That calendar is still my most popular project EVER! Love to see what it looks like when you are done!